Can I rent a bike in Hanoi and get it back in Ho Chi Minh City, or vice versa? Yes. You are allowed to do both ways. However, there is 14-day minimum rental requirements and you will have to pay a return/shipping fee. Please contact our offices for more information about your motorbike rentals Vietnam or Tours. Flamingo Travel recommends you rent from Hanoi, where our Head Office is located, and get a chance to purchase the bike of your likes from our large fleet. As soon as you arrive at Ho Chi Minh City, our branch will immediately provide you a smaller bike (e.g. a Honda Scooter), so you can easily commute in the city and surrounding areas. Upon your request, we can make sure larger bikes are sent down from our Hanoi Head Office. In this case, we will need an advance notice and a deposit before we make the necessary arrangements. It all points to renting your bike in Hanoi and then return it in Ho Chi Minh City, so you can choose the bike you like most and travel with it, increasing your satisfaction. Are there any pick-ups and drop-offs outside Ho Chi Minh and Hanoi? Do I get to activate a 3G Sim Card? Yes. 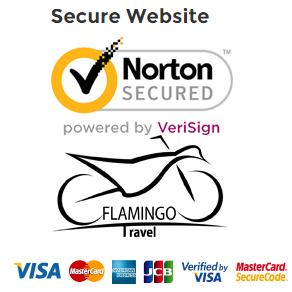 Before you start your motorbike rentals Vietnam or Tour trip, Flamingo Travel offices in both Hanoi and Ho Chi Minh City sell 3G Sim cards, at cost price that are ready to be activated. The cost of a Sim card averages $5 and you can benefit from some extra credit. We recommend you add the 500mb 3G Sim card, for a few more dollars. If you need help activating your Sim card or make any top ups, we are always here! Do I get 3G Coverage and phone signal in Vietnam? Vinaphone is the best provider in Vietnam, which is why we recommend Vinaphone Sim cards, so you have full coverage throughout Vietnam and an excellent quality signal, even in the most remote areas. Is motorbike insurance included in the price? Our Guided Tours packages include bike damage insurance at an extra cost. Nevertheless, there is no motorbike damage insurance offered for our Self-Guided Tours, as well as rentals. Also, no medical insurance is provided for the person driving the motorbike. Are there any recommendations, in regards travel insurance? Medical insurance of any type is not sold or offered by Flamingo Travel. Our customers usually have their own personal insurance, mainly because having foreigners insured in Vietnam is a complicated, time-consuming process. Moreover, the compensation you can get for an accident is significantly low. So, it is best if you came with your own medical insurance that you would have acquired in your country. Do you have any safety and health tips, in general? #1: Make sure you have any medication you might need at all times. #2: Inform your guide of any health problems you might have, so, in case of an emergency, your guide can act proactively. #3: Check with your doctor, since you will be travelling in Southeast Asia and recommended inoculations should be properly taken care of. For more travel safety advice, please consult a knowledgeable travel guide. How do I make reservations and pay for my trip? To make a reservation for your motorbike rentals Vietnam or Tour, you only need a deposit of 30% of the total trip price, paid in advance. You can make a deposit with a bank transfer, at least 15 days before the scheduled departure. Alternatively, you can use our secure online payment system, One Pay. In this case, there is an additional 5% transaction fee you will need to cover. As for the remaining balance, you can pay it in cash (USD, GBP, EURO, or VND) in our office, or by charging your Credit/Debit card, which will cost you an extra 3% transaction fee. Can I drive a motorbike in Vietnam without a driving license? Please contact our offices for details regarding driving license matters in Vietnam. Are beginners encouraged/allowed to take part in a motorcycle trip? Since you will be travelling with our assistance and guidance at all times, it is possible. We also hold a training course that usually takes place a day ahead of the departure of your Vietnam motorbike tours or rentals and is specially designed for inexperienced riders. Through this course, you will learn all you need to know to operate a motorcycle and give you the necessary confidence to ride one. At this point, we suggest you select a bike that suits your riding skills and is appropriate for beginners (e.g. not too big or with extreme motor power). When should I visit Vietnam by motorbike, to get the best of it? The North is popular in every season, but the best time to visit Vietnam is during Fall (September to mid-December), as it is the time of the year when the weather is neither too rainy nor too hot. All you can expect from your motorbike rentals Vietnam or tour at this time of year is clear blue skies with rare clouds, every now and then, allowing you to take superb pictures and live the experience of riding next to terraced rice fields as they ripen, next to amazing hillside views. That being said; you can also visit northern Vietnam between May, June, and up to mid-July, because the transition from spring to summer is so welcoming; not too hot, yet, with occasional light rains and lots of clear blue skies so you can be overwhelmed by the beautiful green vegetation and landscapes you pass by. Central Vietnam is quite hot and dry from May to mid-Fall (October), and wet from December to February. Compared to the coastal strip, you will find the Central Highlands cooler, especially from November to March. South Vietnam is either dry or wet, as it experiences only 2 of the 4 seasons. The hot and more pleasing months are from February to April, while from May-November, the weather is wet, and rains are heavy, but last 1 or 2 hours and then clears up instantly. From December and all the way until April, it is the dry season. It is a region where lots of weather changes occur in the evenings. How many hours do we drive each day? We usually ride for about 4-5 hours per day. However, it all depends on your riding skill level and your program. We have several stops to take photos, during the day, or to have drinks and short visits in the selected villages we pass by. For the longer tours, we can make accommodation arrangement, so you take some rest from riding. How much cash would be sufficient? Are there any other expenses I should be expecting? For our customers on guided package Vietnam motorbike tours, Flamingo Travel covers all expenses, except phone calls, souvenirs, tips, personal medical insurance and alcoholic drinks. As for the money you should be bringing with you, considering that there are some pretty impressive minority crafts in the markets you come across, during the tour, you may want to take an extra $200, just in case. What is the ideal duration for a tour? Ideally, an 8- or 9-day tour should be satisfactory. However, if you want to go beyond that duration, it is best you don’t exceed 12 days on the road as your body will start showing signs of fatigue and strain. That being said; there are many travelers that are indefatigable. For them, Flamingo Travel has a special 18-day trek that will take them exploring the entire northern Vietnam. Ideally, what is the minimum duration for a good ride? If you want to reach out to the delta plains and get into the mountains, and complete an excellent loop, at the same time, we will need at least 4 days. But, if you do not mind riding for a full day, we can get you onto some back roads and show you the beautiful side of life on the road, in just 2 days. I travel solo, but I would like to join a tour group. Is this possible? Yes. It all depends on our bookings and the number of people we have at the time. We always try to offer our customers a compatible program, so we usually organize groups of a spontaneous nature. If you have any particular requirements from your trip, please feel free to let us know of your limitations and/or preferences, so we find the perfect group for you. I want a solo trip. Can you arrange this, instead of a group trip for me? By all means. We organize individualized tours, motorbike rentals Vietnam and make sure you know what you will need to know, so you can enjoy a splendid exploration of the country, at your own pace. Other than that, we can also make arrangements, so you join one of our self-guided Vietnam motorbike tours, where you use your GPS and just follow the route that has been planned for you, through picturesque back roads. In self-guided tours, we can also suggest the best places to visit and the best facilities for accommodation and leisure. These tours are perfect for those that want peace of mind, without risking getting lost or overcharged. There is always the option just to rent a motorbike and with our years of experience and knowledge, we can point you in the right direction. With our guidance and 24hr assistant support you can rest assured you will enjoy a stress free trip! Is the traffic in Vietnam as dangerous as I have heard? It depends on your driving style. At times, traffic in Vietnam could become overwhelming, but if you ride with common sense and comply with some basic rules, you will not have issues whatsoever with the traffic in Vietnam. We recommend though that you travel with a guide as provided by us, so to ensure utmost safety for you. Of course, you will need to closely follow your guide’s instructions to accomplish that. Other than that, being discreet and using good judgment can always become your allies when traveling. Also, make sure you wear your safety gear when you ride your motorbike, not speed over the limit (over-speeding limits your chances for a safe stop if needed, too), and carefully slow down when you are travelling on slippery or wet roads. As for blind turns, it is advised not to ride too quickly around them. And, one more thing…In Vietnam, using the horn is not considered rude; on the contrary, it is something drivers and pedestrians expect, so use the horn to let others know of your presence. What are the road conditions in Vietnam? In the majority, the roads are in good condition in Vietnam. However, expect occasional potholes and of course like any other country road maintenance, which is never a real issue to be concerned about. There are plenty of dirt roads trails in the north’s mountainous regions that can be avoided by inexperienced riders or enjoyed by more experienced and adventurous riders. Please note that sometimes some off road trails can become impassable or too muddy, due to heavy rain (in the rainy season). You can expect busy roads in major highways and in the bigger cities during rush hour. What should I do, in case of an accident? During your motorbike rentals Vietnam or if you’re on one of our tours, if there’s an accident It is customary for the bigger of the vehicles involved in an accident to pay. For example, a vehicle driver will pay a cyclist, a driver will pay the motorcycle driver, etc. However, if you do get involved in an accident, first you need to let our guide talk on your behalf or you can call our 24hr helpline to calmly discuss with the other party to resolve the situation. In case you disagree with one another, Flamingo Travel will call the police and they will resolve the issue. The most important thing to remember is to keep calm and our guide or our 24 hr help line will prove a valuable assistant that will help you get through the situation that has arisen. Remember our 24-hour support for our customers is just a phone call away to solve all your issues! What happens if the motorbike breaks down? This is an extremely unusual thing to happen, given the proper care we have for our fleet. However, in the rare case your engine fails, we take full responsibility to fix your motorbike, as long as your breakdown is not the outcome of neglect or misuse. We have support all around the clock, and we have a comprehensive network of local mechanics spreading all over Vietnam to deal with the more serious problems. In case the motorbike needs damage repairs that are not covered, according to our Policy, you can repair the bike anywhere you want, providing you only use authentic parts to fix the motorbike. Important Notice: Flamingo Travel does not charge for labor repair, or on parts. If I want to travel to Vietnam, what should I have with me? Your passport for starts! Also, make sure you have made the necessary arrangements for a valid visa. Pack your bags considering your needs and based on the seasonal weather. All that should ensure you have made a good start, so you can live a pleasant experience, during your motorbike rentals Vietnam or tour. A final tip: make sure you have some extra money with you, because you will most likely want to buy some souvenirs and small gifts, especially when we stay overnight at a lovely homestay! What is the ideal clothing to bring along? What footwear is ideal for motorbike trips? Should I just leave my walking boots behind and lighten my pack? Strong footwear is an absolutely must during your motorbike tours, to ensure you drive safely. Leather boots or trekking shoes make the perfect footwear for motorbike trips, while shoes that leave your toes exposed are out of the question. You can find boots in Hanoi, in many sizes that cost from $15-$50. Should I be taking ALL my things with me, or do I leave some at the hotel (the base)? Our saddle bags are spacious enough to carry many of your belongings (Roughly 7kg each side) Additionally, we can also have an extra rucksack or bag strapped onto the motorbike if needed. Anything else left could be safely stored in our offices or your hotel. We can also arrange your luggage to be delivered safely between either of our two offices in Hanoi and HCMC. Nothing to worry about! Can you make any accommodation arrangement for us? Of course. We arrange hotel reservations. We can also arrange for a car to come and pick you up from the airport and then drive you straight to the hotel of your choice. What is the quality of the hotel and the food I get to eat? Quality varies with location, in both accommodation and food. Like in all major cities, there are world-class facilities with international cuisine, as well as numerous local restaurants, where you can find many quality levels and prices. If you travel in the countryside, you will most likely not find Western cuisine. However, there are several towns that offer both formal dining facilities, alongside traditional restaurants and food cooked by street vendors. As for the more remote areas, quality in food definitely varies significantly. If you are particularly worried about food safety, you can as well buy snack food and pre-packaged, processed food from the many grocery shops on your way! Accommodation is a different thing in Vietnam. Hotels are generally well-appointed and clean, even those that are in the budget price range. There are many reasonably-priced hotels in Vietnam, and even if you are visiting the country solo, you can still get a great bargain if you just shop around for that super price you wanted! Tip: If you want to spend your night in a remote area, it is suggested you choose a town of a populous center, because you have more accommodation options available. I want an Entry Visa to Vietnam. How do I get one? You will need a visa while in Vietnam, so here is how you can acquire one. Start early on the process, as it can take up to 14 days (and sometimes even longer) to get a visa. Important Notice: You DO NOT need a Vietnam Entry Visa if you are planning to travel in Vietnam for less than 30 days. This applies to residents of Laos, Brunei, Cambodia, Myanmar, Indonesia, Singapore, Malaysia, Philippines, and Thailand. Also, you DO NOT need a Vietnam Entry Visa if you are planning to travel in Vietnam for less than 15 days. This applies to citizens of Finland, Denmark, Norway, Sweden, South Korea, and Japan. I want to apply for a Vietnam Visa. How do I do that? 1. You can contact the Vietnamese Embassy in your country, who can pre arrange your visa. Please note: In order to board the plane in your country you must have either a Visa from the embassy in your country or you must have an invitation approval visa letter. Please don’t hesitate to contact us and let us know of your requirements. During my Vietnam Visa application, I was asked to give contact info and the details of my contact in Vietnam. Should I be giving such information in advance? Just enter the details of a hotel (any hotel) in Hanoi! I still have a question unanswered! Can I get some help? You bet! You can always contact us directly, or email us at info@flamingotravel.vn. Of course, you can reach us by our live chat or alternatively, let’s talk over the phone, during business hours!